One hundred fifty years ago today, Qing China’s last great ruler, the Empress Dowager Cixi, having seized the helm of the state she would drive for 47 years, had her deposed predecessor executed. Formally, China was being “ruled” at this time by the illustrious Tongzhi Emperor, age five. This child’s old man, depressively self-medicating at the drubbing China was taking in the Second Opium War, had died young, leaving his only son the throne, in care of a council of regents. As one of the late monarch’s key advisors, Sushun was among that eight-strong panel, and he was popularly regarded as the worst of the lot — vicious, drunken, spendthrift, and just the guy to blame (along with co-regents Zaiyuan and Duanhua) for all the vicious, drunken, and spendthrift stuff the deceased emperor had put his seal to. Or, just the sort of stories trumped up by the rivals of the man really steering the state. Either way is good. More perilous for Sushun was his burgeoning rivalry with “the Concubine Yi,” the master of harem politics and mother of the new boy-emperor. She had long distrusted the courtier. 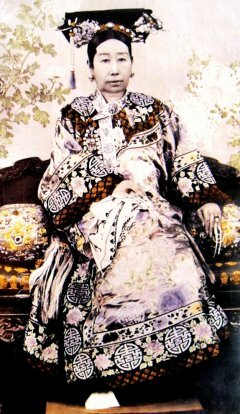 Recast in both title and name with her lover’s passing, the woman now known as “Empress Dowager Cixi” was able to obstruct the regency’s policies. And she did one better than that, intrepidly allying with disgruntled princes to engineer a coup d’etat against Sushun’s faction. The end of Sushun’s regency arrived within months, and transpired within days: less than a week separated Sushun’s liberty from his beheading in a vegetable market. (Striking a liberal pose, Cixi declined to have him put to death by lingchi.) Cixi’s side simply took him into custody, decreed his execution on the attainder of a secret committee, and speedily carried it out. Zaiyuan and Duanhua were ordered to commit suicide the same day. “Surely,” wrote a British diplomat who had only barely avoided execution at the hands of the lately toppled regime, “we may trace the finger of God in these events, and trust that they augur well for the future of China … we yet may see peace or order return to this poor torn country.” Peace and order and a robust opium market, he meant. But whatever the form, the poor torn country was in the hands of the Empress Dowager Cixi from here on in. For a half-century, she would be the consummate survivor — but it was survival during an epoch of terminal decline for the Qing. Riven by conflicts within and without, the imperial system simply couldn’t adapt. And when the cagey Empress Dowager finally died in her 73rd year, the whole enterprise came apart. On her deathbed in 1908, Cixi named as emperor the toddler Puyi. A few years later, revolution ensured that Puyi would be the last person ever to hold that title.